Respirex chemically protective suits, jackets and trousers offer best-in-class protection against a broad range of chemical hazards encountered in the workplace. All garments are type approved and CE marked to the relevant European standards. Our ChemprotexTM fabrics are designed to protect the emergency responder and chemical worker against toxic, corrosive gases, liquids and solid chemicals. Chemprotex™ garments are durable, lightweight and provide an effective barrier against a broad spectrum of toxic industrial chemicals, dual use chemicals, chemical warfare agents and other harmful contaminants. PermaSURE® (Patent Pending) is the latest innovation. It is a software modeller App that puts you in control. When wearing a Chemprotex™ garment, it provides you with both toxicity information and a guide as to how long you can be exposed to a challenge chemical before harmful toxicity limits are reached. 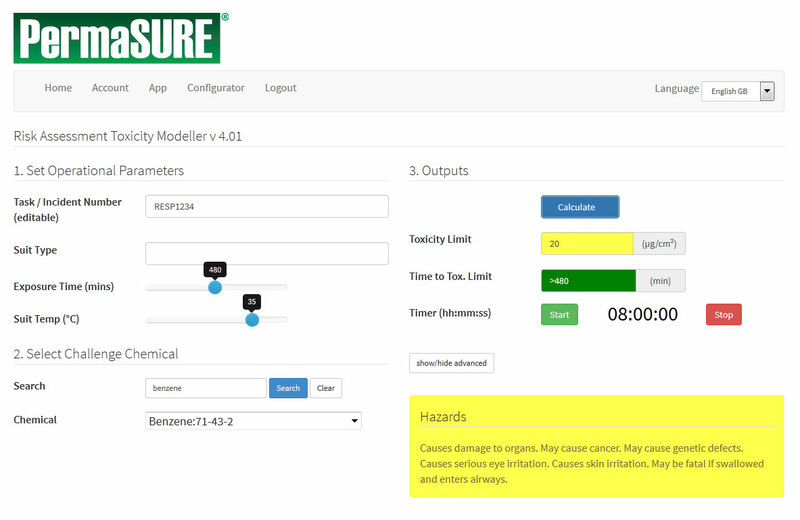 Permasure is also available as an app for iOS or Android devices and can be found in the Apple App Store or Google play by searching for 'Respirex Permeation Modeller', or use the links below. The PermaSURE App is designed to work on any browser-enabled device such as a smartphone, tablet, laptop or desktop. 1. Simply scan the QR code on your Chemprotex™ garment. The App can also be accessed from the App link (above) after you Login. Copyright Industrial Textiles & Plastics Ltd Permasure® is a registered Trade Name of Industrial Textiles & Plastics Ltd. Please read the terms of this Agreement carefully before installing or using the PermaSURE Toxicity Modeller software. This is a Legal Agreement (“Agreement”) between you (“you”, the “Licensee”) and Industrial Textiles & Plastics Ltd (the “Licensor”, “us”, “we” or “our”) hereinafter referred to as ITP. It applies to the PermaSURE Toxicity Modeller Software (“Software”) designed to report on permeation characteristics of membrane materials. Your Right to use the Software is governed by the terms of this Agreement. Installing this Software on to your computer or hand held device (“Computer”) indicates your Acceptance of these Terms. If you do not accept these Terms, do not install this software. You agree to be bound by the terms of this Agreement and any other terms which we may publish from time to time. The terms of this License may be modified by us at any time and your continued use of the Software after publication of any modification shall be an acceptance of such modification. The Software is a proprietary product of Industrial Textiles & Plastics Ltd (ITP) and is protected by copyright and other laws governing intellectual property. Title to the copyright and intellectual property in the Software and any copy, modification or merged portion of it shall at all times be and remain that of ITP, and you shall have no right, title or interest in it, except as expressly set out in this Agreement. Nothing in this Agreement shall restrict ITP's rights. c) Use of the Software is permitted for private use, for educational, scientific and non-commercial purposes, and may also be used in providing services in your business subject always to the stated limitations on use. i) Use the Software for any criminal or corrupt purpose or in a manner that violates any applicable law. If you do any of the foregoing, your License is automatically terminated; such termination shall be in addition to and not instead of any criminal, civil or other remedies available to us. In all uses of the Software, Industrial Textiles & Plastics Ltd must be acknowledged as the source. Use of the Software for any purposes other than those set out above is prohibited without our express prior written agreement. Any permission granted may be subject to a fee. To apply for permission, please contact Technical Department, Industrial Textiles & Plastics Ltd., Stillington Road, Easingwold, York YO61 3FA, United Kingdom. This Agreement shall commence as soon as you have installed the Software on your computer. You may terminate this Agreement at any time by destroying all copies of the Software in your possession including all copies of any parts of them. This Agreement shall also automatically terminate if you fail to comply with any term or condition of this Agreement, in which event you agree to destroy the original and all copies of the Software in your possession including all copies of any parts of it. If requested by us, you shall provide ITP with written certification of such destruction of the Software in your possession. All sections of this Agreement, with the exception of the permissions provided under Section 1 (License) shall survive termination of this Agreement. The Software is provided on an “as-is” basis and with no warranties, express or implied, of any kind and we disclaim any implied warranties to the fullest extent permitted by law. ITP does not make any representations nor give any warranties as to the content, accuracy, completeness, quality, merchantability, noninfringement, as well those arising from any course of dealing, usage or trade practice, fitness for purpose, performance or freedom from errors of the Software. ITP does not make any representations nor give any warranties that the Software will meet your requirements or that its operation will be uninterrupted or error-free, that it is free of viruses, trojan horses, software locks, spyware or any other similar defects or effects of using the Software, or as to any conflict or damage to any of your hardware or software, or that the Software will be compatible with your hardware or software. This Agreement creates no obligations on the part of the Licensor other than as specifically set out in this Agreement. Specifically, and without limitation, this Agreement creates no training, maintenance or service obligations. Any liability of the Licensor in respect of the Software will be limited to refund of purchase price (if any). ITP excludes all liability whatsoever, to the fullest extent permitted by law, in respect of any and all loss or damage of any kind arising from or out of the use or inability to use or the unavailability of the Software and the information and material contained in it or your use of the Software for any purposes other than the intended uses. In no event shall ITP or any its officers, employees, agents or contractors be liable to you or any other person for any direct, indirect, incidental, special or consequential loss or damage (in each case including but not limited to damages for computer failure or malfunction, loss of data or data being rendered inaccurate, or failure of the Software to operate with other computer programs or any loss of profits, loss of contracts, business opportunity, revenue, goodwill, or anticipated savings, even if ITP has been advised of the possibility of such damages or loss) of any kind arising out of the use or inability to use or unavailability of the Software, whether resulting from tort (including negligence) breach of contract, product liability or other form of action, even if we have been advised of the possibility of such damages. You accept all responsibility for your use of the Software and agree to indemnify and hold ITP harmless from any liability or claim of any person or organisation arising from your use of the Software. In no event do we authorise you to use the Software in applications or systems where it or your failure to perform can reasonably be expected to result in physical injury, or in loss of life. Any use by you is entirely at your own risk, and you agree to indemnify and hold us harmless from any claims or losses relating to such unauthorised use. You install the Software entirely at your own risk, and where you rely on any information or other material contained in the Software you do so entirely at your own risk. (iv) that you will take all additional necessary and proper precautions to prevent any unauthorised use or disclosure of this confidential information. You agree to notify us in writing immediately of any unauthorised possession or use of the Software or other materials or information supplied or made available to you under this Agreement by any third party. You acknowledge that any breach of your obligations concerning confidentiality will subject us to immediate and irreparable harm for which money damages would not adequately compensate and, accordingly, you hereby consent to the granting of injunctive relief (whether preliminary, temporary or permanent) against it without the posting of bond or other security or proof of damages. You understand and acknowledge that to the extent that proper operation of the Software requires the use of any software developed, owned or marketed by third parties ("Third-Party Software"), you must obtain your own separate license for such Third-Party Software at your own expense. If any provision of this Agreement is held to be void, unlawful or unenforceable, then that part shall be deemed to have been severed from this Agreement and the remaining provisions shall remain valid and enforceable to the fullest extent permissible by law. ITP provides the Software in order to assist in the derivation of permeation characteristics of membrane materials to assist with risk assessment criteria. ITP's objective is to make this information as complete and accurate as possible, but the Software may contain typographical errors, technical inaccuracies or errors of fact. ITP may make changes to or update the Software from time to time without notice and without obligation to do so. Changes will be noted on the PermaSURE website and users should check from time to time whether they possess the most recent updated version. This Agreement contains the entire agreement between the parties in relation to the subject matter and supersedes all previous agreements, understandings, negotiations, representations, statements and discussions between the parties, whether oral or written. No rights, obligations, representations or terms, other than those expressly recited herein, are to be implied from the Agreement. This Agreement shall be governed by and construed in accordance with the laws of England and Wales and the parties agree to submit to the exclusive jurisdiction of the courts of England and Wales. Any questions concerning this Agreement should be referred in writing to: Managing Director, Industrial Textiles & Plastics Ltd., Stillington Road, Easingwold, York, YO61 3FA, United Kingdom. Subject to the limitations, disclaimers and statements as set forth below, Industrial Textiles & Plastics Ltd. (ITP) represents to the Buyer that the product or products delivered to the Buyer conform(s) to the manufacturer's description and specifications attached to or delivered with the product. The representation that ITP makes to the Buyer that the product or products conform(s) to the manufacturer's description and specifications applies only under such circumstances when the Buyer utilises the product or products as specified and under normal use for which said product was intended. Any alleged nonconformity shall be made in writing to ITP specifically stating and describing any such alleged nonconformity. The representation by ITP that the product or products delivered to the Buyer conform(s) to the manufacturer's description and specification as attached to or delivered with the product is expressly in lieu of all other representations, warranties, expressed or implied, and of all other obligations and liabilities, including consequential damages, on the part of ITP. ITP neither assumes nor authorises any person to assume for it any other liability in connection with the sale of the product. The representation of conformity by ITP as represented by ITP shall in addition to the above be null and void in the event that the product is misused or handled in a negligent manner by the Buyer or any third party. ITP shall not be liable for damages or delays, if such occur, on account of defective material or workmanship or delays in shipment, nor will any allowances be granted for any repairs, alterations, work done or expense incurred in connection with any repairs, alterations or replacements except on specific written authority by ITP. ITP excludes to the fullest extent permitted by law any liability or responsibility for injuries or damages to persons or property arising out of the use or operation of the product as herein contemplated, and Buyer hereby agrees to indemnify and save harmless ITP from all such excluded liability and responsibility. Nothing in this disclaimer of express and implied warranties shall limit or exclude ITP's liability for death or personal injury caused by its negligence or for any other matter in respect of which it will be unlawful for ITP to exclude or restrict liability. ITP shall not be liable for any consequential damages for any reason including but not limited to those contemplated herein and whether such consequential damages may have been foreseeable, proximately caused or otherwise occurring. ITP emphasises that the data for the chemical resistance is based on data from multiple sources. ITP does not guarantee the accuracy and correctness of such data, and does not accept any responsibility for any loss or damage that result from the use by customers or by any third parties to whom such data may be transmitted. The user is required to carry out the appropriate tests to ensure the suitability and safety of the products for the use envisaged in accordance with all applicable regulations. No warranties or assurances of reliability, suitability or fitness for a particular purpose of specimens or data are offered. Final determination of the suitability of any information or material for the use contemplated and the manner of use is the sole responsibility of the user and the user must assume all risk and liability in connection therewith. The information in this document, specifications, samples and PermaSURE Modeller software are merely illustrative and do not form part of any contract or any intended contract. They are supplied free of charge. Test results are obtained under laboratory conditions on new material and not under actual usage conditions. Test results only relate to the sample tested. Due to a policy of continued research & development, ITP reserves the right to alter the details as described without notice. Products are offered subject to our Conditions of Sale, which are available on request. This disclaimer of Express or Implied Warranties constitutes a significant limitation on the rights and remedies otherwise available to the Buyer, which the Buyer freely and voluntarily acknowledges and accepts as part of the consideration for the contract to purchase the product or products from ITP. PermaSURE is a Registered Trade Name of Industrial Textiles & Plastics Ltd.